Happy Cinco de Mayo! I'm feeling pretty festive today (or maybe I'm just craving tacos...) so I thought I'd share some of my favorite Spanish picture books. Or really, to be more specific, the Spanish bilingual books and Mexican culture stories I enjoyed using my Head Start Preschool storytimes (you can see a couple highlighted bilingual storytimes I did here). So here are my top eleven! Plus some more, because I always seem to think of other random titles here and there in my descriptions. 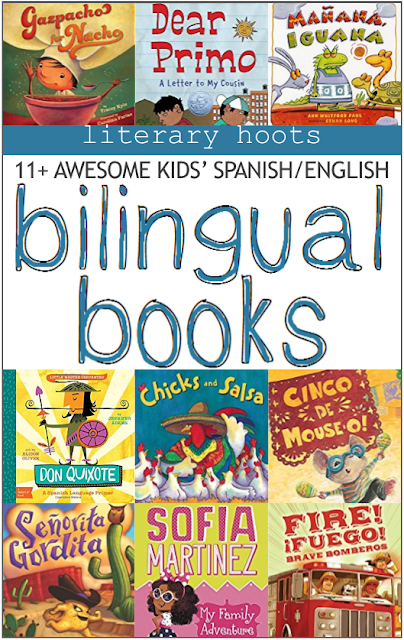 There are, of course, many more awesome bilingual books, so if you have a favorite, don't forget to share them in the comments below! ¡Que felicidad! It’s Cinco de Mayo, and Mouse follows his nose to the festival, where musicians play, dancers stomp, and delicious treats abound. This one would be most appropriate for today, of course! Mouse gets to enjoy a proper fiesta (although he should beware the cat) and even tasted some candy. Another awesome Mexican holiday book I enjoyed is The Dead Family Diaz, which celebrates the Day of the Dead. The chickens are very tired of their chicken feed. Luckily, the farmer's wife has been watching some cooking shows and Rooster knows just what to do. This celebration of Mexican food (mmm, guacamole) is pretty silly, but still lots of fun. It's also very similar to another play-on-food-words, Mice and Beans, by Pam Munoz Ryan, which is another great Mexican culture story. A little corn cake has escaped from the frying pan that cooked her and is on the run! Yep, a Spanish version of The Gingerbread Man. It has a lot of Spanish vocabulary (all the animals she's running from) and is a total hit with the kids! Well, until the very end... This author/illustrator team actually has a lot of awesome southwestern-flair retellings that are sure to please, such as Armidilly Chili, and There Once Was a Cowpoke Who Swallowed an Ant. So no, this isn't a Mexican cultural book, but it does involve classic literature (albeit, from Spain) and learning Spanish. Plus the illustrations are so cute and it's aimed for those youngest of readers, so yes, I'm including this one. This is a cute one to share with tots and babies. Great for beginning readers, Sofia Martinez is a fun and spunky character dealing with all sorts of family drama (it is hard to be the youngest, you know). The story also has a good amount of Spanish vocabulary—any Spanish words that Sofia and her family use are highlighted and there's an index in the back with the translation. There's also other helpful hints and activities at the end, too. Be sure to check out all the books in the Sofia Martinez series. A classic! Iguana is planning a fiesta. Tortuga the tortoise, Gonejo the rabbit, and Gulebra the snake all want to come. But do they want to help Iguana deliver invitations or stuff the pinata or cook the food? No, no, and no! A lazy trio loses out in this Mexican retelling of the Little Red Hen. Again, be sure to check out more from this author/illustrator duo, such as Fiesta Fiasco and Tortuga in Trouble (a Little Red Riding Hood retelling). This is the story of two cousins, one in America and one in Mexico, and how their daily lives are different yet similar. The text is quite beautiful, with a good sprinkling of Spanish vocabulary. It's a perfect introduction to Mexican culture. Okay, yes, I have a thing for food, especially Mexican food. Yes, a lot of these books have to do with food. Sorry, not sorry. This one is really cute, though, so I have to share it. The beautifully rhyming text (yes, English and Spanish words both) tell a perfectly relatable story about a picky eater. It's sure to be loved by all ages. The Discover the World Alphabet series is a favorite of mine. This book has little poetic phrases for each letter of the alphabet, introducing different topics about Mexico. What's even better is the good amount of factual text included to support each topic. This is a good nonfiction choice to share with kids. Firefighters are super brave and this book shows what a day in the life may look like for these heroes—with a healthy dose of Spanish included! Yes, this really isn't a Mexican cultural story, but I do so love Dan Santat's work. And plus, the rhyming, simple text is awesome—good for beginning readers/ Plus, there's an index at the end that explains the many Spanish words. This book is more of a tag on to remind you that many classic children's books have been translated into Spanish, making for a great opportunity for kids to learn the language. Do they have a favorite they've practically memorized? Get them the Spanish translation! Do you have a favorite Spanish bilingual or Mexican heritage picture book? Share them in the comments below? Thank you for this list! I'm an elementary librarian and I'm always looking for great bilingual books for my students. I have a few of these, but I'm adding some of your titles to my must-have list.